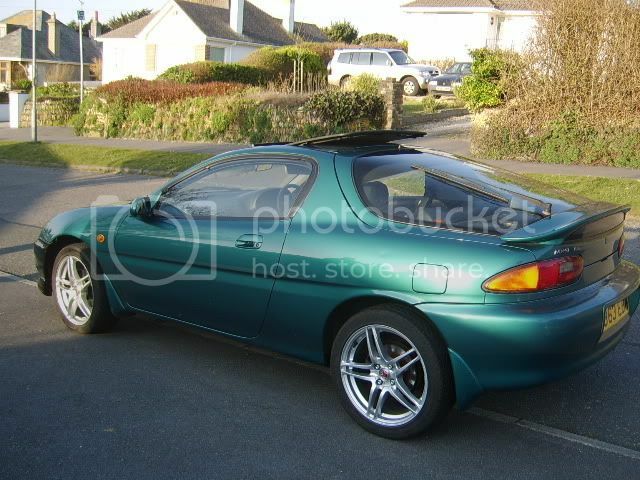 my mx 3 guys, 1.8 v6, 94 110,000 miles.long mot and tax just needs new exhaust.I just paid …................................£400.And she drives lovely! looks very clean i like it in black! cheers guys, and one more. How do i get them to come up in the post? Done, cheers guys. Jesus mate what mug sold you that for 400? Very nice. I had a similar bargain (much cheapness) My baby was £800 with 89,000 on the clock and FSH. The only thing i have had to do so far is replace a bulb in the sidelights and i am getting a nice new rear bumper in a couple of weeks. I'm also saving for a full respray so that the black can be returned to its full glory but it does come up lovely after a good bit of spit and polish. :lol: i beat u all. i paid £350 for a p reg with 92, 000 with service history and all it needed was a bumper and the mot was due, but flew through. i love a good bargain.